Visit wineries in Prince Edward County May 18th & 19th. 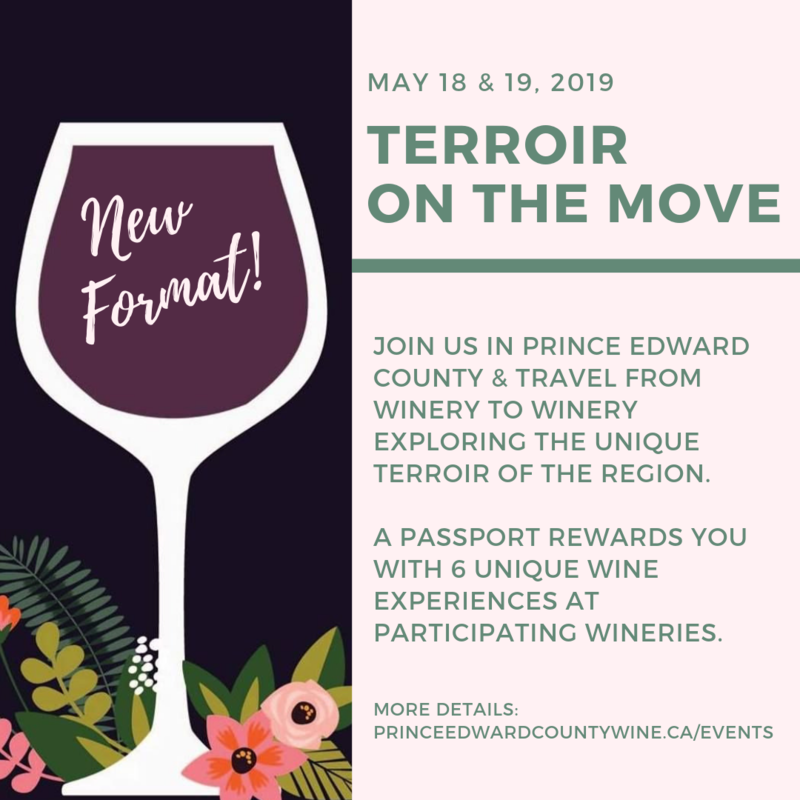 The Terroir on the Move Passport gets you unique 6 unique wine experiences at participating wineries. A $60 value is only $50 incl HST! Visit wineries in Prince Edward County May 18th & 19th. The Terroir on the Move Passport gets you 6 unique wine experiences at participating wineries. A $60 value is only $50 incl HST! Cellar tasting with the winemaker- taste from barrel with Maggie at 11:00am on Saturday and Sunday. Enjoy a sample of 1 oz each of a red and white and finish with a 5 oz glass of our popular Pixie Sparkling wine, served in a keepsake Govino glass. Our enhanced tasting includes a stroll through the vineyard led by one of our wine connoisseurs. You will get a chance to learn about our history and wine-making practices. Following the vineyard tour, you will visit our private barrel room for a tasting including barrel tastings, and vintages from our library complimented with pairings. Spring On The Pinot – Vertical Pinot Gris Tasting Paired with Farm-to-Table Canapés In the Wine Cellar. Explore two very different styles of Pinot Gris with winemaker Amy Baldwin – 2017 skin fermented Pinot Gris and 2018 Pinot Gris (no skin contact) each served with a complimentary canapé from our Farm to Table Restaurant. New Spring Releases paired with fun locally-sourced artisan snacks. Launching our summer Caribbean – themed food program. Experience Exultet’s Terroir with up to 4 Free Select Wine Tastings! Psychowinetasting: Do you trust your taste buds? Or, do you taste with your eyes and con yourself into believing you are a sommelier? Blind folded tastings will test your capacity. Led by Vida, winemaker and psychotherapist. The results could send you into therapy. Meet the dynamic duo husband and wife team of Sugarbush Vineyards. Rob (the winemaker) will walk you through a tasting of 5 new spring releases paired with Sally’s (the winemakers boss) favourite snack, Miss Vickie’s chips. Each flavour of chip will be paired with a fresh, bright new spring release. This is fun, relaxed look at wines with the person who know them best, the winemaker himself. “Finding Meaning in Terroir: Small-Group Structured Tastings by the Vineyard. Explore emerging wine styles, grape, and the importance of site. 5pm – Grand Cru Too! : The case made in 5 glasses (in red and white) of fantastic vineyard sites at home in Ontario. Cost: $25/pp. $15/pp with your Passport. Reservations required. Alta Red is finally ready! We are going to pair it and a couple more of our natural wines with some exceptional artisan cheese and meats! Not your Average Pairing – with PEC’s only off-grid wines and tasty snacks at Redtail Vineyards. Spring Wine Release, Cellar Tour and $5.00 off pizzas. Our spring releases paired with snacks from our new catering friends at West 33! New Spring Release – 2018 Pinot Gris Rose Emily paired with a delicious Bruschetta Antipasto or La Cultura Salumi cured meat! Several Exciting New Wines to be paired with some delicious favourite snacks . Speak directly with the Winemakers and Grape Grower, Kristen Rogers and Michael Lewis will be your hosts. Join Spencer Mayer, Assistant Winemaker, on the Vintner’s Deck to be greeted with a tasting of our newly release 2017 Estate Grown Chardonnay and our 2017 Niagara Chardonnay as Spencer guides you through the wine and the difference between these two regions. Walk our vineyards to our production building where you will taste from two different bottles of Pinot Noir from two different County microclimates. Enjoy a demonstration of how food pairings can enhance the flavor of wine on our crushing pad. Finally, let Spencer tour you through production as he indulges you with a double-barrel tastings of our Estate grown Malbec from two different vintages, all to further demonstrate the effects of Terroir. Guests will be given the opportunity to order these limited, yet to be released wines. 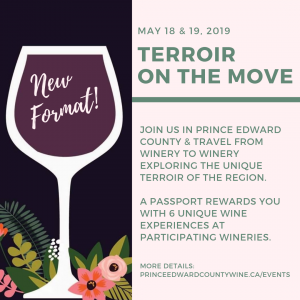 $25.00 per person or $15.00 with a Terroir On The Move Passport. Reservation required. Each session limited to 12 guests. Call 1(613) 399-3000 or email tours@karloestates.com with “Terroir on the Move” in the subject line to get on the list. A credit card number is required to confirm your reservation. $5.00 per head for bookings canceled within 24 hours of tour.